Yesterday, I followed the excellent tweeters from the first day of authorspeak2011, a conference featuring 99 Solution Tree authors, currently underway for three days in Indianapolis. Of course, as I read it, my thoughts turned immediately to my genius students! How exciting! I have a day already picked out for genius hour–the morning before Thanksgiving in America because I know I will have some extra time with them. It’s on the books–our first genius hour! One full hour for 11 randomly-chosen teams of 3 to work together. They will be charged with communicating, collaborating, and creating. They will have freedom within their group, though, to work on more than one idea. They will have access to three computers, if needed. By the end of the hour, they will connect and contribute, reporting their genius work to the world on at least one blog post. We’ll have 35 minutes at the end to report back–three minutes for each group. What new idea do you have that you want time to develop? What tool can you learn to help you work more efficiently? What tool can you learn to do work more beautifully? What tool can you learn to help us communicate better? Now, I have just finished my first genius hour! Actually, it’s been about 1.5 hours. I have never before been able to research, conceive, draft AND post on this blog during a school day. This morning, I have done all those things, as well as planned a potentially revolutionary lesson plan for 33 junior highers. Pretty productive morning, I’d say, thanks to the fact that I was given a “genius hour”! I find it sad that my students are busy taking state-mandated tests while I get to have a genius hour. What else should I add to our first student genius hour? 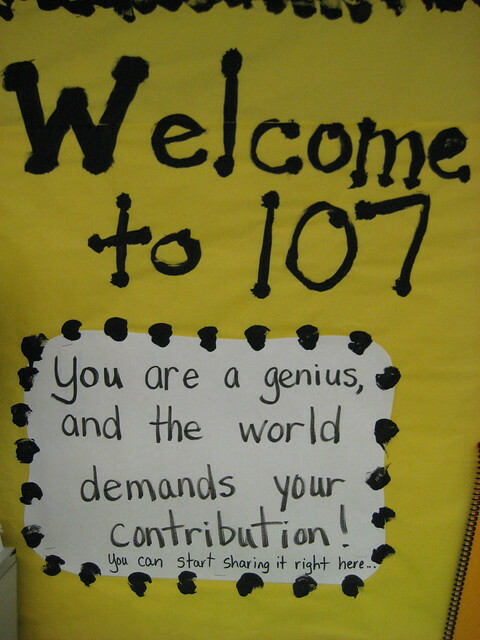 Have you done or will you do genius hour with your students? Please report about it on Twitter with the hashtag #geniushour. Maybe you could start by telling them that the original meaning of “genius” was “to produce”… which means they can ALL be geniuses. Seems like that was an apt description of your genius hour – productive! I am so glad you mentioned that. I love your genius post. I am always telling my students that they are geniuses, but now I can add some meat to it with your great etymological study. Thank you for directing us to your post. Really love the idea, and that there are teachers out there willing to step outside the little box that curriculum, testing and schools have placed around learning. Providing students the opportunity to make an actual contribution, to find a problem and pose a solution, is an invaluable experience. I hope you post more about this project as it moves along. I am interested to see what your geniuses come up with. Thanks for the comment and the visit. Another illustration from Dan Pink’s talk I read about in a blog was awesome, and so I’m going to be reading his book Drive. I’ve been thinking for days about this great illustration and it’s application for teachers: A group of artists were asked to create artworks–some pieces were commissioned by outsiders and some were creations of their own choice. Then the art was evaluated by an impartial art critic. Not surprisingly, the art critic found more value in the works that were created by the artists’ choice. Although the commissioned pieces were technically well-done, they were missing the special ingredient that the choice brought to the piece–perhaps, passion. Anyway, my goal with this project is to let students create their own impassioned school work, not commissioned by me. 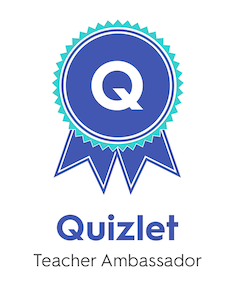 off topic… did u or one of your students create the blog’s main graphic? My daughter painted that acrylic flower painting. I took a photo of it and cut out that section of the painting. (She asked me why I put it on sideways, but I think it’s beautiful any which way.) Thanks for asking. I need to give her credit, so I’m going to add that to my sidebar. Drive is a great read. Keep up the good work. First of all – I love your new graphic – it’s beautiful and just perfect for the “genius” post. I am impressed that while your students were testing, you were making plans for them. BIG plans! How exciting to be given the time to work on something of their own choosing. I can’t wait to hear how it all will unfold. One suggestion (maybe)…you are putting the students in random groupings. Do you think you could present your idea to the class and then allow them to work with others who might have the same interest? Just a thought. Sometimes it works out best if the groups are random. I’ll bet you’ll find that after the hour the students will not be quite done and want to continue…they will be so engrossed in what they are doing. The kids in your classroom are very lucky to have such a caring and inspiring teacher who, as Devin says, ‘steps outside the little box’! Thanks, Nancy, for the comment and the idea. I began telling the students about our plan, so they can start thinking about what they might want to do. They are excited. I’m also able to give them a bit over an hour (maybe up to 1.5) because I realized I have an extra period for reporting back. I think you are right, the time will go fast for them. I like your idea about grouping by interest, though I don’t want the groups larger than three. I do want to try to implement a modified grouping. I’m not sure how it will look exactly. I want to be sensitive to those who don’t fit in as easily. Thanks for your thoughts!